Section headings and selected papers: Grinding and Separation. An expert system for control of a SAG/ball mill circuit, S H Bradford. The control of mineral processing plants using neural network techniques, W Stange. Iron- and Steelmaking. Development of a scheduling expert system for a steelplant, K Stohl et al. An expert system to aid operation of blast furnace, T H Choi et al. Continuous Casting and Rolling. Expert system for manufacturing order determination in hot-rolling process, H Fujimoto et al. Expert systems for the automatic surface inspection of steel strip, R Haataja et al. General Applications. A data based expert system for engineering applications, D W Ginsberg & W J Whiten. 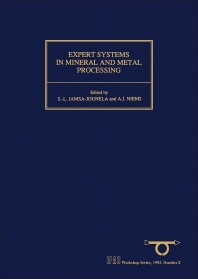 Adaptive expert systems for metallurgical processes, E K Juuso & K Leiviska. New Methods. Neural networks for steady-state process modelling and fault diagnosis, J J Cilliers. PROGNOS: A prototype expert system for fault diagnosis of the transmission system of load-haul-dump vehicles in Kiruna mine, Lkab, Sweden, N Vagenas. Plenary Papers. Requirements and technologies for operations management decision support systems, L K Nenonen. Application viewpoints of expert systems in mineral and metal processing, K Leiviska. Author index. Keyword index. Within the metal and mining industries, the use of expert systems for monitoring and control is on the increase. The content of each paper had to include both expert systems, neural networks or fuzzy control. The papers were evenly contributed from industry, universities and research institutes, thus this book provides a valuable insight into the theoretical as well as the practical applications currently in use within the industry. For systems scientists and engineers involved in the mining and metal processing industries.